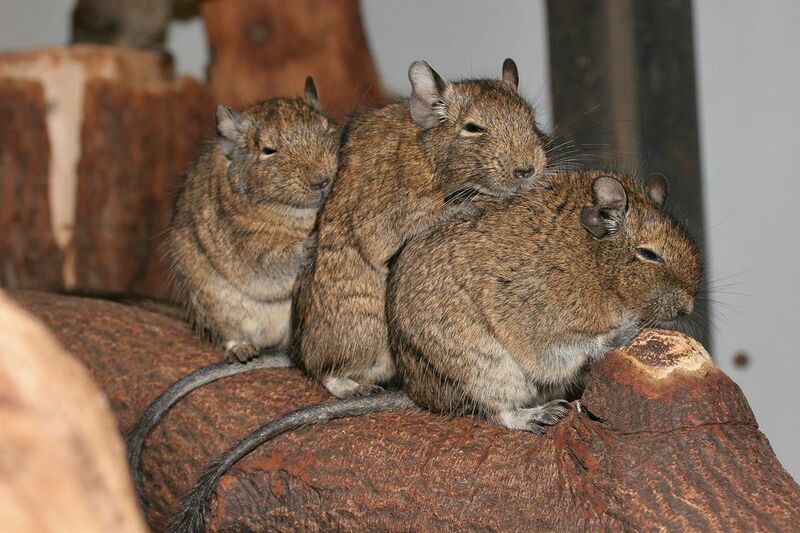 Degus have furred tails that may look like a handle to small children. Accidents happen during handling and also while in their cage or with other degus. Knowing what to do if your degu injures his tail is something all degu owners should be educated on, even if you know those tails aren't handles. Degus have a tail about half as long or as long as their body, or five to six inches in length. They use their tails for balance and as an aid in communicating to other degus. The entire length of a healthy degu tail is furred with the end of it giving the appearance of a paint brush leading some people to refer to them as trumpet-tailed rats. Under the fur are layers of skin, nerves, muscle and vertebrae (bones) which enable the degu to beat, wag, and balance with their tail. It is not just composed of cartilage similar to our ears or nose; degus can feel in their tails. When the fur and skin layers come off of the tail it is referred to as a degloving injury. This usually occurs because the degu was attempted to be picked up by his tail or the tail was stuck in something like a wheel, cage door, or under a bowl. Degloving is also referred to as shed tail. Tails can also break because they have bones in them. Sometimes the break will heal on its own but other times the injury requires the tail to be amputated above the break. Degu tails can be cut, scraped, or bitten by another degu and get infected. By keeping the tail clean and moist you can give your degu the best chance for a full recovery but you may need to get an antibiotic cream or oral antibiotics from your exotics vet for it to heal properly. If your degu has received a degloving injury to the end of his tail it is very important to try and clean it with water. It will most likely bleed and if the bleeding hasn't stopped after fifteen or twenty minutes the tail may need to be sutured by your exotics vet. If it does stop bleeding on its own or after applying a styptic powder, cornstarch, or flour to aid in clotting then it will dry out after a couple of days. Once the tail end has dried out your degu will usually chew the end of the tail off. It is your job to monitor the tail for any discharge, smell, or swelling that would indicate an infection. If you are unsure if the tail is healing have your exotics vet (find an exotics vet near you) look at it to determine whether or not antibiotics are needed. If your degu stops eating or becomes lethargic do not waste any time in getting him to the vet. It's fairly easy to avoid tail injuries but of course, accidents may still happen. You can lessen the likelihood of a tail injury by never picking your degu up by his tail, not using a wire wheel in his cage, and by being careful when closing cage doors, setting down houses and bowls in the cage, and being aware of where is the tail. How Do You Safely Trim Iguana Nails?